For many years now we have been frequently asked by homeowners & professionals alike how we are able to achieve such good results over time. Lawn care is a science (called Agronomics) & there can be many complex issues to consider. The following article covers some basic concepts, in simple layman’s terms that we would like you to know. The fundamental long term objective of a good turf grass management program is to achieve & maintain turf density – a thick & vigorously growing lawn. Thin turf is the root cause of most weed & pest problems. There are three critical interrelated aspects to having a nice lawn. These are: Mowing, Watering and Treatments. If any one of these three critical elements is incorrect, then the desired results will not be obtainable. The following is a more detailed discussion of each critical factor. We have found that most folks tend to think of mowing in terms of cosmetic or aesthetic purposes. However, there are many key reasons for mowing beyond merely having a manicured lawn. Mowing Frequency: Weekly mowing throughout the growing season controls many undesired weeds & annual grasses that cannot be controlled effectively with herbicides alone. For example, cool season grassy weeds cannot be treated in the spring with herbicides, due to the temperature dependent nature of the post-emergent that can selectively control them. By cutting these weeds low every week, a great deal of stress is placed on the undesired grasses & it eventually eliminates them. Mowing frequently forces the grass to grow horizontally instead of vertically & thereby achieves the all important turf density! Cutting Height: Selecting the correct mowing height is absolutely critical. Mow low only in the pre-season thru early spring. This allows more transfer of sunlight to the root system & usually results in an earlier green up. As the lawn begins actively growing, progressively raise the cutting height. Mowing too low creates a lot of stress on the turf grass, which becomes a major problem in the summer & really shows the following spring. Mowing too low also will produce scalp marks & uneven appearance of the cut. Maintain the cutting height of your lawn mower between 3-4 inches throughout most of the season. This drastically reduces stress on the grass, helps retain the vital moisture, protects the root system & helps maintain color. Mulch with a Sharp Blade: Except for the initial pre-season low mowing, do not bag the grass clippings. Bagging removes the desired nutrients & organic material from the lawn. Keep your mower blades sharp at all times and use a mower with mulching capability. Never cut more than 1/3 of the grass blade. The fundamental premise that we advise is water deeply (long run times). It is less important how often you water than how long the station run time is set. 70 minutes of water per week split into daily watering at 10 minutes will produce a drought stressed thin lawn, whereas 2 weekly watering cycles at 35 minutes each will produce much better results. Your lawn will be much more dense & green with deep watering verses frequent shallow watering. UNDER INTENSE HEAT OF 95-100 DEGREES DURRING WATER RESTRICTIONS: On your two allowed weekly watering days: irrigate 30-45 minutes between 4am & 10am AND 20-30 minutes between 6pm & 10pm. Additional manual hand watering of dry spots is necessary when temperatures exceed 90 degrees. This deep watering schedule will improve drought tolerance, while complying with city guidelines. 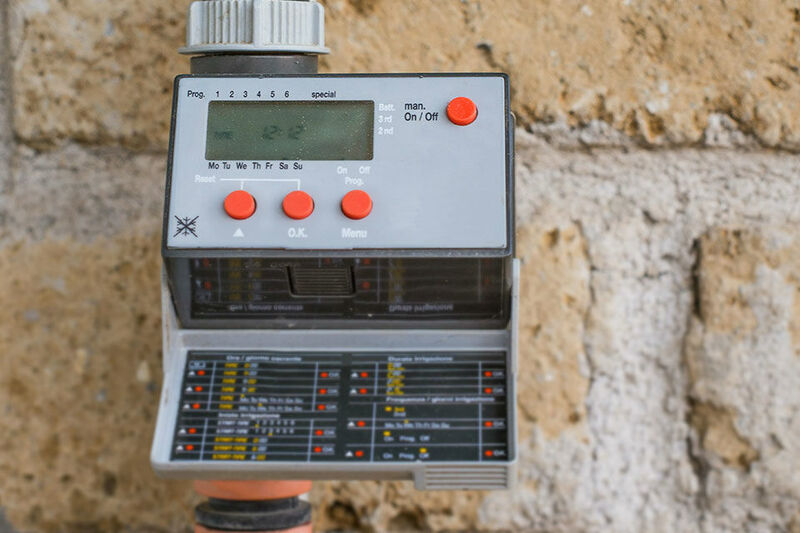 Most sprinkler systems have a setting you can select to run a test. You run the test & observe the operation of each station to ensure that all the sprinkler heads are functioning & that they are adjusted for even coverage. You also identify if each station is pop ups or rotor type sprinkler heads & which stations if any are for flower beds. Pop ups water the entire area covered for the full run time. Rotors are sprinkler heads that oscillate back & forth (note these also “pop up” out of the lawn). It is important to note that rotor type heads usually must run about twice as long to get the equal amount of water as pop ups. The best time to water is early morning, about 5:00 AM. Remember half as much on flower beds, twice as much on rotors. Most modern sprinkler systems have options that allow you to water every other day, every 3 days or setup a 7 day custom schedule/cycle. On a Rainbird system, this will probably be called “watering schedule” on the dial. You set it to the number 7. Then you turn the dial to “watering days” & select the specific days to water. Note that there are many different brands of sprinkler control boxes & they each vary somewhat. Consult your owner’s manual for specific instructions on general operation. 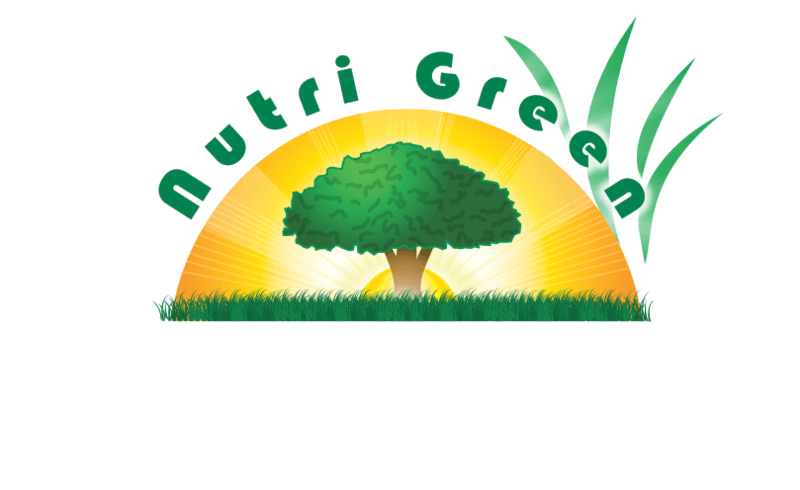 This gets very technical & is beyond the scope of this article to cover in detail; however we would like to mention a few things the customer should know about NUTRI GREEN’S very unique lawn treatment program. Each application is different & is tailored to the specific needs of a particular lawn. The reason why there is a program of 8 treatments per year is that different issues can be addressed effectively at different timing throughout the season. You will not likely see the full results of the service until you have been a customer for one full year. Gardening by its nature, requires time & patience. Each application is critical; there are no lesser important treatments. If you miss a scheduled service, it will show in the long term – if not immediately. Organic vs. Chemical: Our philosophy is that there are advantages & disadvantages to both schools of thought on this. An all organic program will cost you about three times as much as a standard program & essentially offers no truly effective weed or pest control. A purely chemical approach does have some environmental concerns. The strategy we employ utilizes both organic & chemical elements. We practice “Integrated Pest Management” (IPM), this means that we only use chemicals judiciously when & where they are needed. Our state of the art lawn care trucks includes a​ proprietary injection system for true IPM performance. Grub Worms: Our annual Grub Worm Treatment is neccessary to maintain turf density & make our lawn program viable. Grubs are a problem to one degree or another on all lawns in North Texas. You do not have an effective weed management strategy in our area without addressing this issue. With this annual service, we also treat non preventable surface feeding insects such as: Army Worms, Chinchbugs, Cutworms & Bermuda Mites should they occur at any time of the year. To ensure great results for our customers, the Annual Grub Worm Treatment is a mandatory part of our basic service package. Seasonal conditions beyond our control can & will affect the lawn. For example, if we have unusually cool temperatures in the spring, your lawn will not green up as fast – especially in the shady areas. If you have any questions regarding proper cultural practices, we are happy to help! 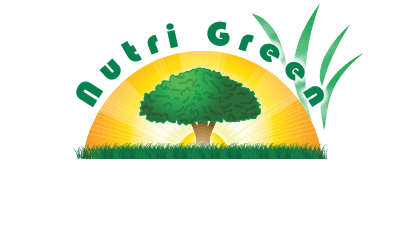 THANK YOU FOR CHOOSING NUTRI GREEN!